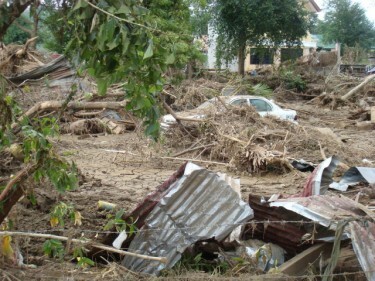 Typhoon Sendong  (international name: Washi) victims, their families, and friends, in the Philippines are using social media to look for missing victims, coordinate and document relief efforts, and record image and accounts of the destruction. 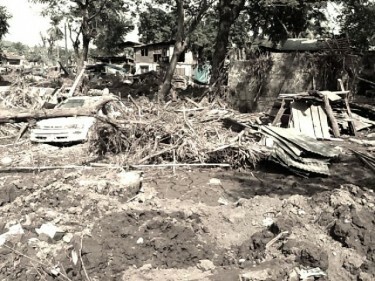 The flash floods caused by the typhoon in the cities of Cagayan de Oro and Iligan in Northern Mindanao and Negros Oriental caused the deaths of 1,257 people, according to government data . Over 45,000 homes have been damaged, leaving thousands homeless. Flood victims have utilized Facebook to help search for their missing loved ones. 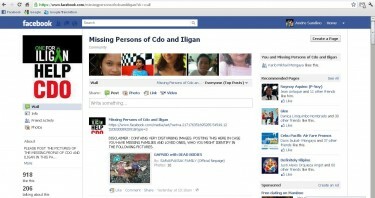 Photos and profiles of missing relatives and friends continue to be posted in the Facebook pages Sendong Missing Persons  and Missing Persons of CDO and Iligan . The Sendong Missing Persons page has since gathered 1,787 likes and 5,341 conversations as of this writing. The administrators, however, have advised the users of the page to coordinate with authorities and not rely on Facebook alone in finding their loved ones . Various images and accounts of the destruction have continuously found their way online. In Dumaguete City, Negros Oriental, Foundation University video manager Mark Anthony Besario was able to capture the devastation brought by rampaging flood waters and posted this online in YouTube . Before the furious flood waters swept through their village, [the dogs] Aspins Loloy and Jackie immediately woke up their humans — scratching the door and barking loudly. Because of the dogs’ warning, Marrietta and her family were able to get to safety. They lost their home, but unlike most families affected by the flood, their family is still complete.